“Live by Night” is set in the roaring `20s when Prohibition hasn’t stopped the flow of booze in an underground network of gangster-run speakeasies. The opportunity to gain power and money is there for any man with enough ambition and nerve and Joe Coughlin, the son of the Boston Police Superintendent, long ago turned his back on his strict upbringing for the spoils of being an outlaw. But even among criminals there are rules and Joe breaks a big one: crossing a powerful mob boss by stealing his money and his moll. The fiery affair ends in tragedy, setting Joe on a path of revenge, ambition, romance and betrayal that propels him out of Boston and up the ladder of Tampa’s steamy rum-running underworld. Download Live By Night in Digital HD from the iTunes store. Live By Night images are © Warner Bros.. All Rights Reserved. Step back into time to a prolific era when men returned from The Great War and lost themselves, where life was easy, alcohol was for the back rooms, speakeasies were the thing to do, and the Irish and Italian Mobs ran the country. Live By Night transports you back into a time that has gone by the wayside- a glorious, relaxing time full of intrigue, crime, and love. 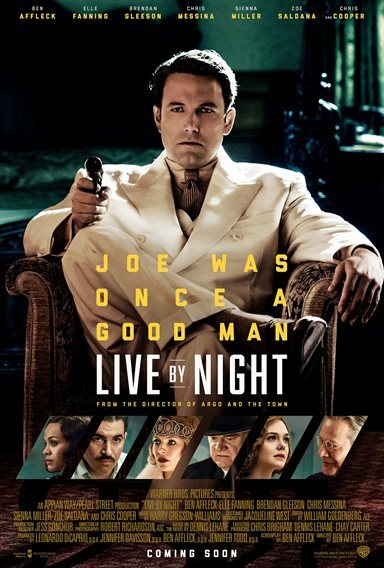 Ben Affleck stars in, directed, co-produced, and wrote the screen play for Live By Night, based on the 2012 novel of the same title by Dennis Lehane. Affleck shows his enormous talent across the board in this film, so let's break it down by category. 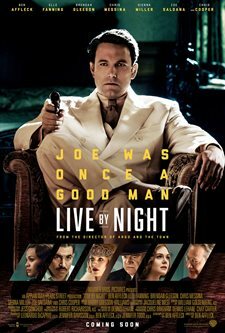 Live By Night is the story of a young Irish man, Joseph "Joe" Coughlin (Ben Affleck; The Accountant) who, fresh home from The Great War, becomes an outlaw, orchestrating small time robberies until he finally gets caught during a bank robbery turned sour. After spending time in prison, Irish Joe approaches Maso Pescatore (Remo Girone; La Piovra) the Italian Godfather with a partnership- Joe will work for the Pescatore family and he will get to take out the Irish Mob leader, Albert White (Robert Glenister; Hustle) who killed his girlfriend as long as he doesn't become a gangster. Sent to Ybor City in Tampa, Florida to work the Pescatore rum business and elbow White out of Tampa, Joe falls in love with a Cuban woman whose family controls the molasses industry, Graciella Corrales (Zoe Saldana; Avatar). Saldana does a wonderful job of being evasive at first, mesmerizing second, and then captivating at the exact moment you need her to be. She rounds out the movie with a believable character who tries to see the best in Joe - and wants Joe to be the best he can be. While in Tampa, Joe makes friends - and then enemies- of the Chief of Police; takes out head members of the Ku Klux Klan, but when he can't secure the rights to a casino in Sarasota, he falls from the good graces of the Pescatore family and goes on the offensive. At first, Joe is in denial that he may be the next body count, but as the story continues, one soon realizes hat Joe is not as naive as he acts about his mortality. Live By Night is all about Affleck's character. While the quality of actors and acting is exceptional, the depth of emotions that Affleck has portrayed in other films seems lacking in Live By Night. You want to sympathize with Joe and feel for what he's been through and what he will go through, but without the support of Zaldana's character, you wouldn't have any connection with Joe. Characteristically, you also want to see the electricity between the lovers but the on screen connection between Joe and Graciella is poor at best. Obviously, while each movie is different and each character different, Affleck has some marked qualities- like the way he looks at a female counterpart in a movie with a half smile and a twinkle in his eye, which is missing from his connection with Graciella. Nonetheless, despite the lack of electricity between the two characters, Graciella's background story was well developed and added an interesting component to a mob- style romance movie. Saldana clearly held her own as an actor. As a screen writer, Affleck did a wonderful job creating a tantalizing story that has all the elements of a crime, drama, and romance story that is all proportionally balanced. The storyline keeps you on your toes, moving from one genre to another without losing focus on the big picture and the smaller sub- plots contained within the bigger plot. Affleck's character provides narration throughout the film, which actually adds to the intrigue and complements the film. Despite that, the movie is just over 2 hours and if it had been 20-30 minutes shorter, Live By Night would have been even more captivating. Overall, Ben Affleck did a compelling job - or four jobs- of creating a storyline full of depth, even though the main character lacked the deep insight that could have made the movie that much better. The overall direction of the film flowed, despite being a bit lengthy, and nothing appeared choppy or misplaced. The sequence of events meshed and the overall production was well put together and classic. Ben Affleck is definitely breaking out of his typical goofy romantic shell lately and Saldana does a good job bringing him into focus. Plan a night out to see Live By Night and, as Affleck's character says in the opening of the film, you'll have "left a soldier and come home an outlaw". Please be good please be good.